Rev. Mark Nakagawa of Centenary UMC recognizes Yoichi Serizawa. 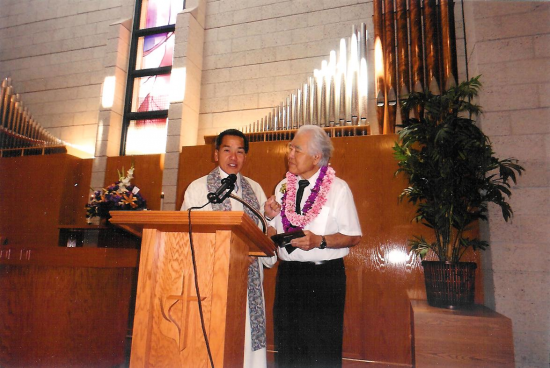 On Father’s Day, Centenary United Methodist Church in Little Tokyo honored all fathers, but gave special recognition to one in particular, Yoichi Serizawa. 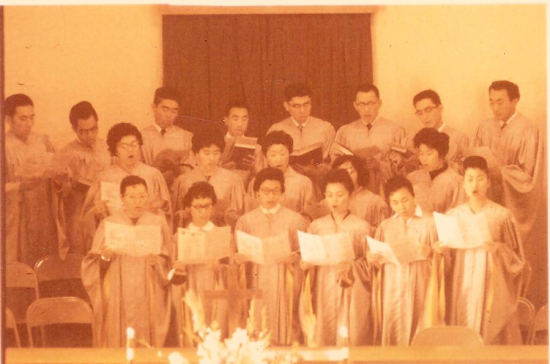 Serizawa, who turned 78 in August, has sung in Centenary’s church choir for 60 years, starting when he was 18 years old. Born and raised in Los Angeles’ Crenshaw area, he first attended Centenary when it was located on Normandie and 35th. He has always enjoyed singing. He sang a solo at his daughter’s wedding, and every year he goes caroling with church members at senior facilities and at the homes of people who are no longer able to go out. Following the Father’s Day service, the church gave Serizawa a plaque and a luncheon. Past choir members were invited to come and sing that morning. Skeeter Sasaki read some background on Serizawa; Emi Takashima and Grace Miyaoka both gave him homemade flower leis; and the City of Los Angeles sent him a proclamation. Serizawa and his wife Emi are the parents of Julie Hubbard, who works at Yu-Ai Kai, a senior service agency in San Jose’s Japantown, and Randy Serizawa of Torrance, a special education teacher for the L.A. Unified School District. The Centenary choir in 1961. Yoichi Serizawa is in the back row, third from left.